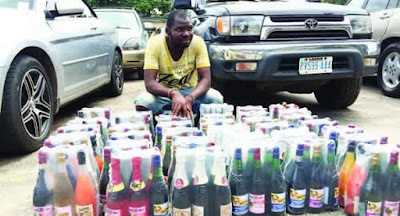 32-year-old Ifeanyi Udeh has been arrested by the Lagos State Police Command for alleged production of adulterated fruit wine. The Lagos State Commissioner of Police, Edgal Imohimi, said on Monday that operatives of the command intercepted the suspect during a stop-and-search duty in Agbowa, in the Ikorodu area of the state. Imohimi said Udeh confessed to producing the adulterated drinks when interrogated, adding that such product led to health challenges. Imohimi urged Lagosians to partner the police to ensure that such activities were halted to save lives. The suspect, Udeh, said he was on his way to search for customers for his wine when he was accosted by operatives of the command. The father of two, who said he had produced 254 packs of the alleged adulterated wine, added that he had yet to register the product with relevant authorities. The Enugu state indigene said, “The fruit wine is my product; the name is Capic, but it is not registered. I will soon get a permit but I don’t have money. I have not supplied anybody yet; this wine cannot kill anybody because I also drink it. This is my first production and I have produced 254 packs so far. “I don’t have workers; I produced the drink inside the house that I rented in Ikorodu. I plan to sell one pack for N1,000 and one pack contains six bottles of fruit wine.